Begin our hike at Will Rogers State Historic Park. If coming by RTD bus, get off at the Evans Road stop on Sunset Boulevard and walk up the trail to the polo field. This will add about 1/2 mile each way. If we drive, park in the lot. Start near the tennis courts west of Park Headquarters and head uphill on a trail bordered with a white wooden fence. This hike quickly takes us to Rogers Ridge then down to the bottom of Rustic Canyon. The steep trails and some boulder hopping in the canyon will challenge our stamina. We will find class 2 rock climbing in the lower canyon and some wet stream crossing when the water is running. If heights bother you, Rogers Ridge will make you nervous. Upon reaching the fireroad, we are given a choice of turning left and walking on a gentle route, or crossing the road onto a steep rough trail. Take the steeper route -- we need the mental preparation for some steeper trails ahead. The trail heads north by west, short-cutting the fireroad. Turn right when we next reach the fireroad higher on the ridge. At the next fork in the road go straight ahead (left of the two options). In a few minutes another fork to the left gives a glimpse of a Kiosk with information on the Backbone Trail. Go to the Kiosk and start uphill to the north. If at anytime we take a wrong turn up to this point, we are likely to end up on Inspiration Point. Look north and see the Kiosk and the trail. The trail up Rogers Ridge is gravelly, steep and rutted. Views south become spectacular and only get better as we gain altitude. After one and a half miles we cross Chicken Ridge bridge. Much of the excitement of this ridge is gone now that the bridge increases the safety. 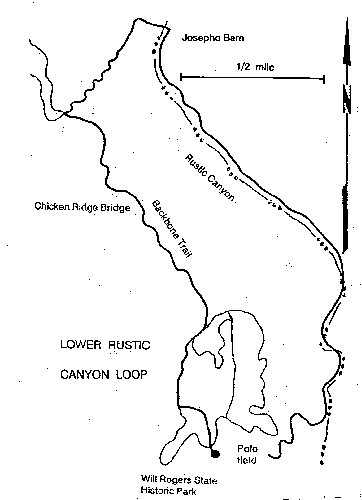 Will Rogers and Anatol Josepho are reported to have designed this route, but had also scouted out a lower trail to the east to avoid the knife-edge of Chicken Ridge. The Chicken Ridge route became the riding trail between the two ranches -- the trail we are on today. Beyond the bridge the trail hangs on a steep rock slope. Severe trail erosion makes the footing difficult so we take care. In less than one-half mile we walk along a scrub oak ridge and come to a trail junction. The Backbone Trail splits going north with one route on the ridge; the other contouring on the slope facing Rivas Canyon. We turn right and walk down to Rustic Canyon. Some great views of Rustic Canyon develop as we descend. Sycamore, cottonwood and walnut trees show a ribbon of green along Rustic Creek every spring. The trail crosses the stream and heads toward a large wooden barn enclosed by a cyclone fence. A large, attractive, multi-trunked sycamore shades the upstream side of the barn. Look for some coast redwoods planted here years ago. The other buildings of the Josepho ranch burned in a fire. The trail downstream drops into the streambed at times, but for the most part stays on the left bank. Ruins of burned-out homes and old foundations are spaced along the bank. The large two-story metal framed structure was part of the Murphy complex. It appears to have been a workshop on the ground floor, and dormitory above. The concrete building to the south housed a power station with two large generators. A large steel diesel fuel tank still stands hidden in the trees of a side canyon. A series of concrete steps will take us up the slope, all the way to Sullivan Ridge west if we can find the route. Farther south a burned cabin is all that remains of Will Rogers' hideaway. The double fireplace remains among the rubble. No one lives in this part of the canyon now. Look for some large bay trees. We'll pass by some large jointed cactus, and be somewhat careful as we pass a beehive in a bay tree. The trail forks right and crosses the stream. The left fork goes to the top of the dam built by the Santa Monica Land and Water Company about 1900. The dam is now silted to the top so no water is impounded. Go around the dam by trail. We can go back up the stream to the base of the dam for a look. The route downstream more or less follows the creek but can no longer be called a trail. We will get our feet wet when the canyon narrows, and will resort to class 2 rock climbing on occasion. Will Rogers built a road up the creek among these rocks. A narrow and steep detour around the dam allowed him to drive through rustic Canyon in his Ford touring car. He built a small log cabin in the canyon. Floods have removed the road and fire has taken the log cabin. We wonder how anyone would have the optimism to put a road through this narrow, rocky gorge. About the time we have had enough of wet boots and slipping on rocks, a trail takes us uphill about 1/3 mile to the east end of the polo field. Many people walk to the stream and back on this, the Rustic Canyon Trail, to Rustic Canyon. Secluded ravines, wood bridges, cliffs, rocks, and the canyon with a stream makes this a special place.